This playlist compiles a selection of valuable learning resources, including several NFB films and sources provided by Citizenship and Immigration Canada, UNESCO, the USC Shoah Foundation and Holocaust education centres throughout Canada. These resources offer secondary-school educators the opportunity to discover new approaches to teaching about the Holocaust and the many lessons it offers on human rights, racism, democratic values, intercultural understanding, citizenship and genocide prevention. Under the leadership of Scott Masters, students at Crestwood Preparatory College have interviewed almost 200 Holocaust survivors on video. Their stories teach important lessons about hope, survival and humanity, encouraging students to stand up against hate and to do good work within their own communities. Compiled by Dr. Carson Phillips, Assistant Director of the Sarah and Chaim Neuberger Holocaust Education Centre. Created by USC Shoah Foundation – The Institute for Visual History and Education, this website features more than 1,300 video testimonies of Holocaust survivors. It enables learners to see and hear the personal stories of individuals who survived genocide and rebuilt their lives. UNESCO believes that it is essential to learn about the Holocaust to better understand the causes of Europe’s descent into genocide; the subsequent development of international law and institutions designed to prevent and punish genocide; and that the careful comparison with other examples of mass violence may contribute to the prevention of future genocides and mass atrocities. “The Holocaust is a crime that stands alone in human history for the scale of its horror and inhumanity. That is why it is crucial to ensure that this experience is never forgotten and that such atrocities never take place again”. – Jason Kenney, Minister for Multiculturalism Canada has invested significantly in Holocaust education, remembrance and research. As Nazi Germany drew the world into war, Canada’s discriminatory immigration policies denied entry to those seeking refuge, particularly Jews. 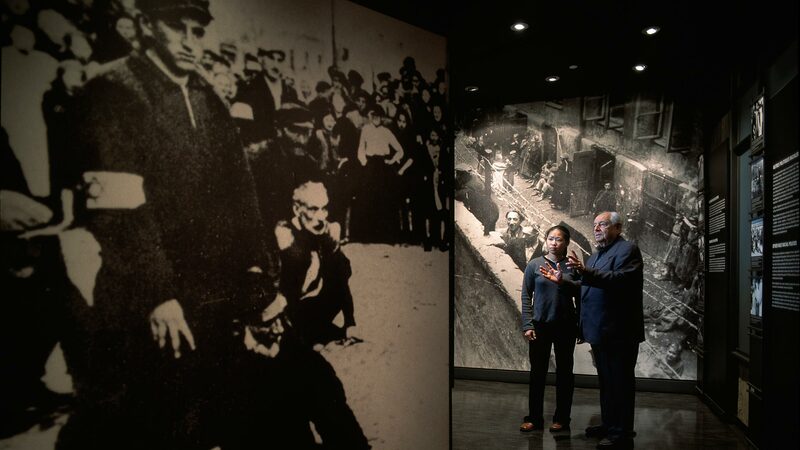 In 1940, when Canada agreed to Britain’s request to aid the war effort by taking in “enemy aliens” and prisoners of war, it did not expect to also receive 2,284 refugees from Nazism, most of them Jews.Through testimony and artefacts, this virtual exhibit by the Vancouver Holocaust Education Centre illustrates a little-known chapter of Canadian history—the story of Canada and the interned refugees. The website features a comprehensive lesson plan for teachers. This documentary follows a Holocaust survivor in 1965 on an emotional pilgrimage to Bergen Belsen, the last of 11 concentration camps where he was held by the Nazis. He and 30 other former Jewish inmates travel through the new Germany. Scenes still vivid in his mind are recalled in flashback. The memorandum of the title refers to Hitler's memo offering a "final solution" to the "Jewish problem." This short animation is director Ann Marie Fleming’s animated adaptation of Bernice Eisenstein’s acclaimed illustrated memoir. Using the healing power of humour, the film probes the taboos around a very particular second-hand trauma, leading us to a more universal understanding of human experience. The film sensitively explores identity and loss through the audacious proposition that the Holocaust is addictive and defining. This short documentary reveals the atrocities that occurred in German concentration camps during World War II. With images of suffering humans and mass graves, this film depicts the events that transpired under Hitler's rule and the condition of the prisoners when they were liberated by the Allied Forces.